A giant poolside mosaic featuring intricate geometric patterns has been unearthed in southern Turkey, revealing the far-reaching influence of the Roman Empire at its peak. The mosaic, which once decorated the floor of a bath complex, abuts a 25-foot (7-meter)-long pool, which would have been open to the air, said Michael Hoff, a University of Nebraska, Lincoln art historian and director of the mosaic excavation. The find likely dates to the third or fourth century, Hoff said. The mosaic itself is an astonishing 1,600 square feet (149 square meters) — the size of a modest family home. 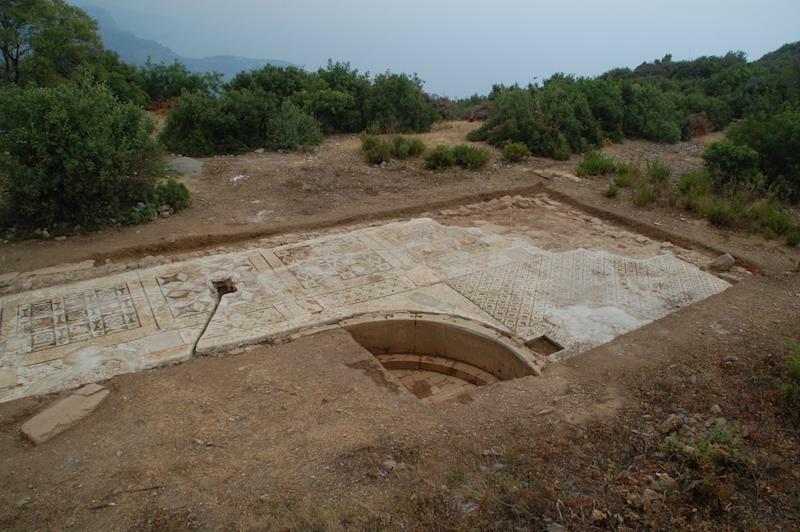 The first hint that something stunning lay underground in southern Turkey came in 2002, when Purdue University classics professor Nick Rauh walked through a freshly-plowed farmer's field near the ancient city of Antiochia ad Cragum. The plow had churned up bits of mosaic tile, Hoff said. Rauh consulted other archaeologists, including experts at the local museum in Alanya, Turkey. The museum did not have funds to excavate more than a sliver of the mosaic, so archaeologists left the site alone. Last year, with a new archaeological permit for the site in hand, museum archaeologists invited Hoff and his team to complete the dig. So far, the researchers have revealed about 40 percent of the mosaic. The floor is in "pristine" condition, Hoff said in a university video about the dig. It would have fronted an open-air marble swimming pool flanked by porticos. The mosaic itself is composed of large squares, each sporting a unique geometric design on a white background, from starburst patterns to intertwined loops. It's the largest Roman mosaic ever found in southern Turkey, which was thought to be rather peripheral to the Roman Empire, according to Hoff. 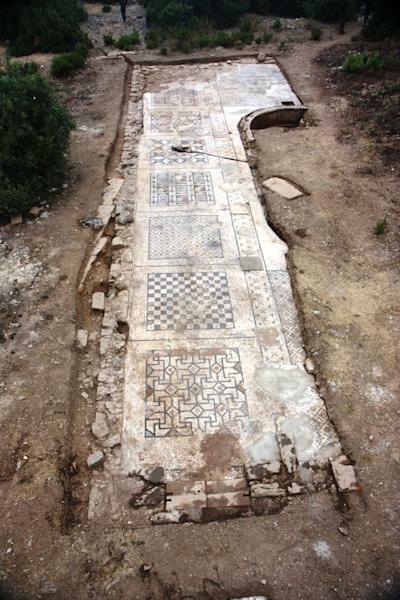 The existence of the mosaic suggests that Antiochia ad Cragum was far more influenced by the Romans than believed, Hoff said. The city of Antiochia ad Cragum, founded in the first century, has a number of Roman features, including bathhouses and markets. Hoff's team has also been excavating a third-century Roman temple in the city and a street lined with colonnades and shops. 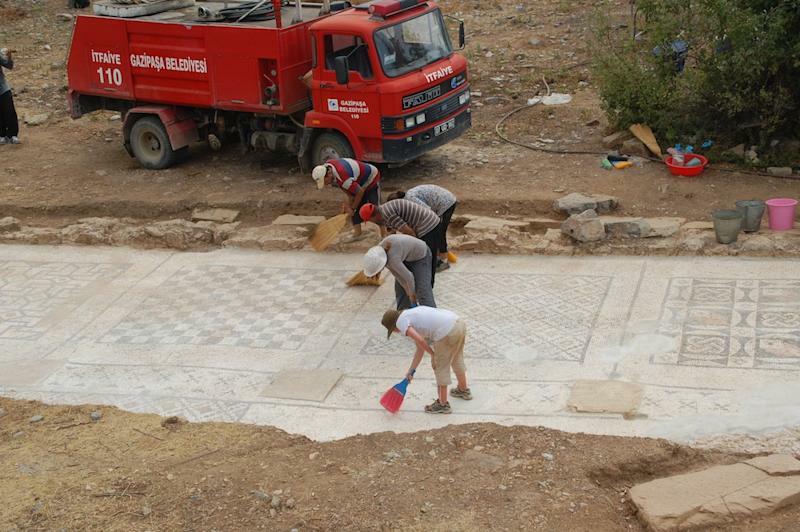 The team will return with students and volunteers to complete the mosaic excavations in June 2013. Ultimately, Hoff said, the plan is to construct a wooden shelter over the entire mosaic and open the site to public visits.